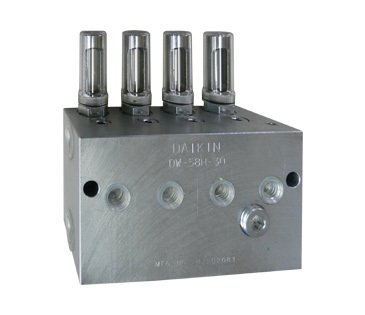 DW (Distributing Valve) | Products | Daikin Lubrication Products & Engineering Co., Ltd.
DW type distributing valve is used for dual line system. The ports are doubled in number from single discharging type (1 port/element) to dual discharging type (2 ports/element) for saving space. Only half the conventional number of distributing valves is needed for the required number of lubricating ports. This simplifies installation and the piping configuration. The installation dimensions of DW-30, 40 and 50 types are all the same. This means that connections between distributing valves and resizing can be easily performed. Note) “Loss” refers to the amount of oil required for operating the pilot piston.When this distributing valve is used for oil, set the pressure below 10MPa.